OTTAWA, Nov. 08, 2018 (GLOBE NEWSWIRE) -- While much of Canada is experiencing typical autumnal weather, the prairies got an early taste of winter, a reminder to always be prepared for unexpected weather. Environment Canada is forecasting a “milder than normal” winter than last year, but you never know what the season has in store. 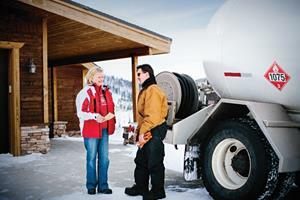 Resident talking with her propane provider during a scheduled visit. The Canadian Propane Association (CPA) and retailers want to ensure customers stay warm and comfortable this season and encourage residents to think ahead and be prepared for unpredictable winter weather. CPA’s Winter Preparedness Tips for Propane Users help residents plan ahead, save money and reduce consumption. Filling your tank early and ensuring there is adequate supply by regularly scheduling visits and enrolling in convenient payment programs with propane providers. For customers who order when they need propane, ordering early while tanks are at least 25 per cent full to ensure they have adequate supply when the weather turns colder but also in case of snow and ice that can result in blocked roads and delivery obstruction. Ensuring your driveway and access to propane tanks are cleared. Marking propane tanks with a flag so damage doesn’t accidentally occur during snow removal and the propane delivery driver can identify them immediately. For the full list of efficiency and safety tips, link to CPA Winter Preparedness. With over 450 members, the Canadian Propane Association (CPA) is the national association for a growing, multi-billion-dollar industry that impacts the livelihood of tens of thousands of Canadians. The CPA develops and produces industry training materials, offers an emergency response assistance plan to its members and provides advocacy services for the propane industry. The CPA does not monitor or provide an analysis of propane prices or supply, and cannot comment on individual businesses’ operations. For further information, contact: Tammy Hirsch, Sr. Director, Communications and Marketing, e. [email protected] p. 587-349-5876.